Bathroom Gets Pallet Accent Wall Makeover! I created this Pallet Accent Wall with the help of a good friend. We applied deck boards to the wall and staggered the wood joints. Additionally, we mixed the tones of the wood for more visual appeal. Finally, we trimmed out around the shower stall with upcycled furring strips. 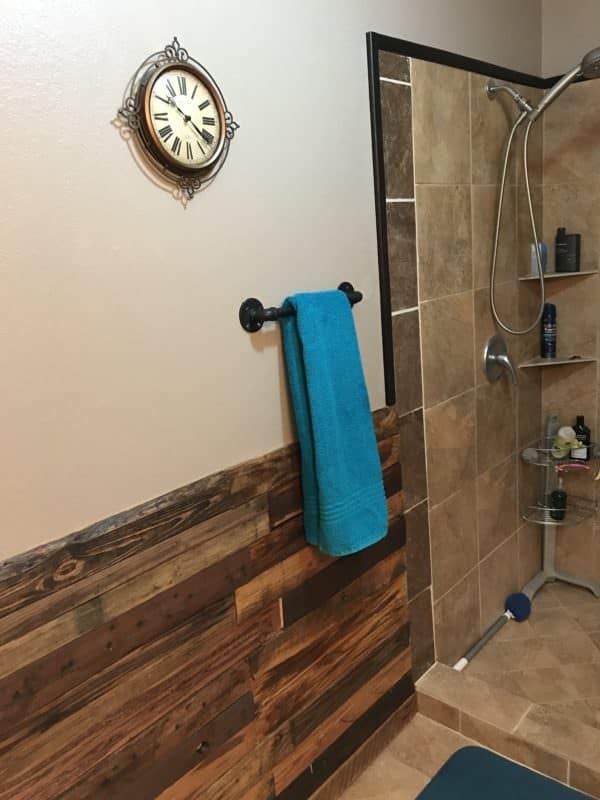 From mediocre to magnificent with a simple project like this Pallet Accent Wall Bathroom Makeover! First, we took apart several heat-treated pallets. Next, we lightly sanded the wood and stained the pieces. We used varying lengths and widths and then staggered them across the seven ft wall. I made this accent wall 42" tall. My friend had given me several pieces of furring strips she found abandoned behind her business. 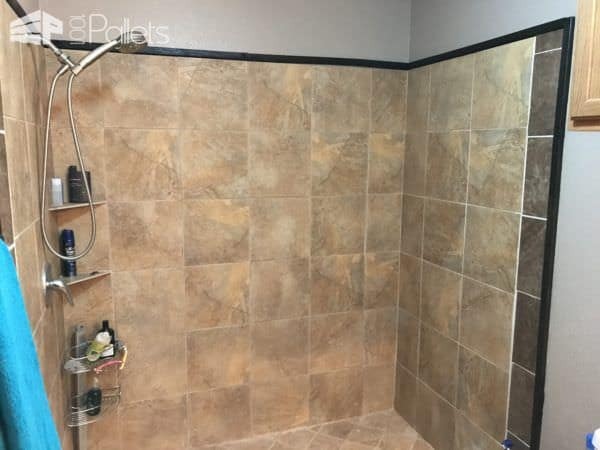 I stained them using Dark Roast stain and outlined the shower with the pieces, attaching them with trim nails with a nail gun. Finally, I sealed all gaps on the trim pieces where water might be able to get in with clear silicone. I didn't measure the pallet wood when I applied it. I used a cut-to-fit approach. Mainly, I had a blast. Add an easy accent to your tile by upcycling some old furring strips. Stain them a complementary tone for your room and attach them around your shower! Isn't this gorgeous? Change boring to beautiful with a simple project like this accent wall. Great idea! Need more pallet wall inspirations? Now check out this Pallet Terrace Furniture Set!